Now, look at the date on your calendar (phone, desktop, whatever). Now look back at the standings. That’s right. 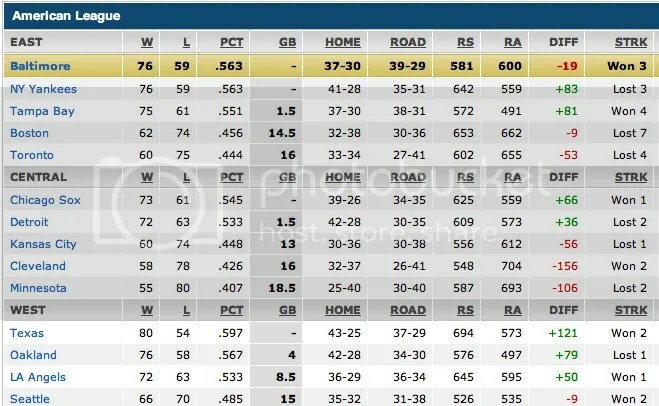 It’s September 4th(or 5th, before 7 P.M. for the above numbers to retain accuracy), and your Baltimore Orioles are in a dead heat for first place in the American League East. The Birds are 24-10 over their past 34 games (best in baseball), and just thrashed the Toronto Blue Jays by a score of 12-0. They are 17 games over .500 for the first time since 1997, which is also the last time they could lay any claim at all to first place in the month of September. Orioles Magic is alive and well. The O’s go for the sweep of Toronto on Wednesday, before opening up a four game set at Camden Yards with the Yankees on Thursday. New York is in free-fall mode, and will try to avoid getting swept in Tampa tomorrow. If they get the broom, and the O’s are able to bust out the brooms against the Jays, the O’s will return home for Cal Ripken, Jr. statue night all alone in first place. Thursday is going to be insane at the Yard. It’s already sold out, but tickets remain for the other three games. Get out there and support your Birds, Baltimore. This entry was posted on September 4, 2012 at 9:16 pm and is filed under Orioles. You can follow any responses to this entry through the RSS 2.0 feed. You can skip to the end and leave a response. Pinging is currently not allowed.